A LibSoX wrapper is now available for Delphi XE8 Firemonkey on Android, IOS32+IOS64, OSX, Win32, and Win64. 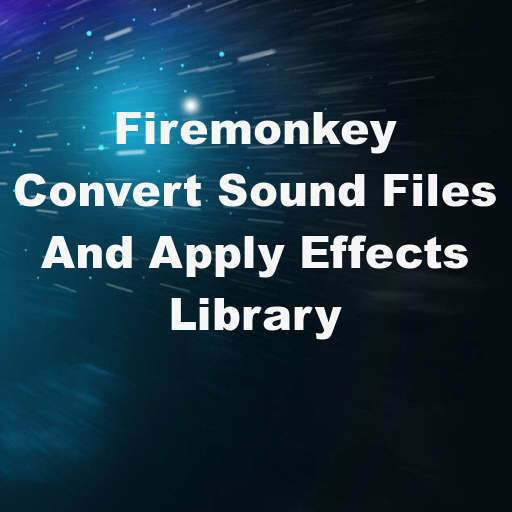 The Sound Exchange library (otherwise known as SoX or libSoX) is an open source cross platform library for converting sound files between formats and applying various audio effects. In a previous blog post I released a translation of the libSoX header file and sample code for Delphi XE7 Firemonkey. This is an updated version of the static and dynamic libSoX library files which includes support for IOS 64bit and Windows 64bit. It supports a variety of sound file formats like AU, WAV, OGG, MP3, and more. Be aware that various sound formats require different licenses and that libSoX includes other libraries for processing some sound formats (see the SoX docs for more information). The effects that libSoX supports include Tone/filter effects, Production effects, Volume/level effects, Editing effects, Mixing effects, Pitch/tempo effects, Mastering effects, Specialised filters/mixers, Analysis effects, Miscellaneous effects, and Low-level signal processing effects. The sample source code has also been combined into a single cross platform project for Android, IOS, OSX, and Windows. Be sure to read the readme file about deploying the appropriate library files for each platform and the sample sound file with the demo app. This sample project and libSoX should also work with Appmethod.